This summer I travelled through the southern part of Germany. I don’t exaggerate when I say that it is indeed a pretty beautiful part of the country. I went to Nuremberg in the state of Bavaria, to be more precise I have to say it is in Middle Franconia. Franconians do not like to be called Bavarians. Everyone I met so far insists to have nothing to do with Bavarians and will never be a Bavarian and never was a Bavarian … don’t ask … I reckon this is one of these things, for ever remaining a secret to outsiders. The sky is blue and the people are friendly. The castles are as enchanting in Franconia as they are in the rest of Bavaria. 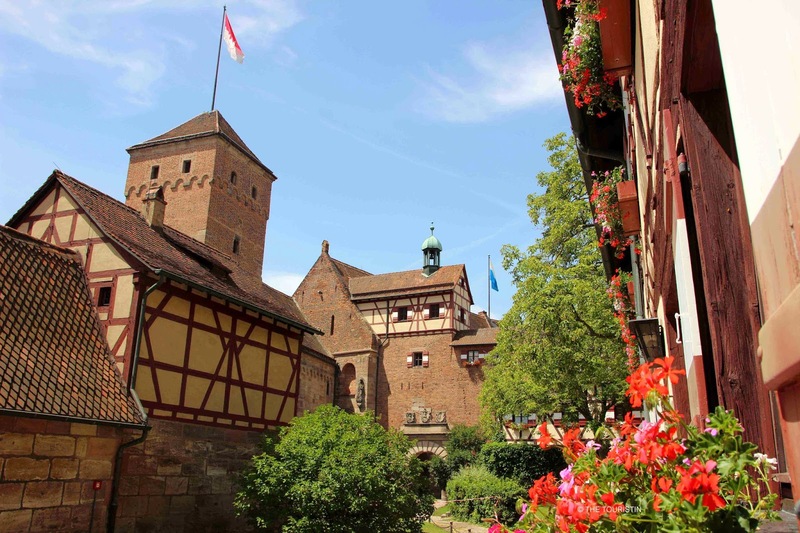 Nuremberg is known as a city with a very high quality of life, its citizens praise its culture and also its close proximity to the great outdoors. This building sits right on the bank of the river Pegnitz. It was founded in the medieval period in 1332, and Lepers were kept here. This is the main square of the old town where you find the farmer’s market during the week. The friendly stallholders offer local delicacies. Construction of the three-aisled basilica started in 1250, the Gothic choir was completed in 1477, in 1525 it became a Protestant church. The Lorenz Church houses the second largest organ facility in Germany. The Gothic fountain was erected around 1385 and looks like a spire (it is not the original one anymore). When you are there ask people for the two brass rings embedded in the fence, find and spin them, they are said to bring good luck. Where: On Central Market. Built by the Hohenstaufens in the medieval period, it used to be one of the most important castles of the Holy Roman Empire. Stop for a break at french style Café d’Azur and have a salad, galettes or some pastries. Where: Burgstraße 11, 90403 Nürnberg. I happened to be in Nuremberg twice this year. On my second visit I was so lucky to be there on the weekend of the Meeting of the Bards (Bardentreffen). All over town were band stands with free for all concerts and stalls selling food and drinks. There were also many street buskers entertaining crowds at every corner. Despite the odd shower it was massive fun and a vibrant atmosphere.